I think they will clear without a lift or trimming. Anybody have in advice on the 31 outlaws compared to the new outlaw 2s? awesome write up helped a ton! ive pretty much decided on outlaws but what size should i get for my 2007 700 cat? 27" or 28"? I have dalton clutch kit with epi green spring, primary shimmed, hmf pipe and snorkels of course lol. I am running 28 mudlites right now with 12" rear and 10" front on itp 12" rims. Thanks! just get 29.5s!! You have a 700 with mods!! Do it right. Youll be fine. Thanks for the info.... Saved me alot of time!!! It never gets any wetter only DEEPER!!! big gun evo exhaust coming soon. I have an 03 artic cat 500 2x4, its mostly stock except for aftermarket air filter, and the 27x9.75-12, 27x12-12 mud machine tires with ITP wheels. We bought it new in 03 with tires, wheels, stick stoppers, skidplates, 2k lb warn winch. In the 9 years of havin that 4wheeler ive NEVER got it stuck. ive been in sum sticky situations but never had to use the winch. It has had its share of abuse but it runs like a champ. Recently i had to push out a 420 rancher with 28 mudlites out and a Rincon with mudlites AND a polaris sportsman 500. When i show up to ride somewhere ppl are like OH look at that old thing and then within a short while im pushin them out so it really is a work horse. I use it anywhere from huntin to workin around the land or just play. Im hopin to put some performance parts on it and a lift. im also wondering if i get some ITP SS108(black) wheels to fit a new set of 27x9.75x12(front), 27x12-12(back), what width should i get. i dont really want the rear tire to be rounded around the sides like a wheel too big but i also want deep well rims for rear and shallower for the front. Hey Cale, I'm curious if you've gotten any ride time on OL2's and what your thoughts are on them. - Love mine, just curious how you would rate them knowing your history on various tires & machines. I have 30x10-12 silverbacks and have zero complaints, but i would still love to try the outlaw or outlaw 2's. I know somebody who might be getting Outlaws in a few months for his kitty so we'll see how the back & law compare. I've had a little seat time on the 28's and watched several sets of the 29.5's perform. The OL2's really are the top performing mud tires on the market, and that's no sales pitch. IMHO, the original Outlaws were as good if not better than any mud tire on the market. The extra lug depth, huge shoulder lug or "ear" and the lug running the entire length of the sidewall allows the OL2 to grab and paddle harder than any other comparable size tire on the market. I would agree, we reccomend Zilla to all our customers, there a little narrower in the rear than the Mud Bug's but still a great looking tread design. I AGREE that mudzillas and outlaws and siverbacks are good mud tires but im putting 28 inches Zillas and what I here there prety good. mudder600, why settle for pretty good ? Why not consider absolutely great. If you want an all-terrain tire, Zillas are OK. But if you want a true, pure mud tire, consider our new 28" Outlaw2 and get great, not pretty good !!! i wanna see a comparison for types of mud.. for ex. 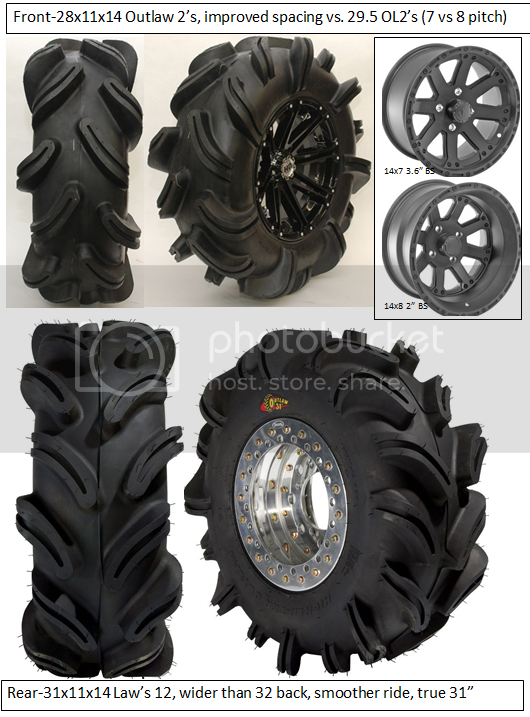 which mud tire will be best for muskeg? or which mud tire is best for hilly rutty terrian? ect..
For my brute 650i should I get 29.5 outlaws, 28" outlaws or 28" silverbacks? I do 50/50, trail riding/mudding. I know they're all great in mud, but which one would be better in trails? And maybe a Little bit of roads, depending on where I ride. Do you have 14" or 12" wheels? For your 12" wheels, the 29.5" Outlaws would pull better and ride better than either of the 28's. I'm about to get a set of tires and rims for my commander and maybe one day put them on a renegade, I want a tire that is good in all types of mud, 14" rim and 28-30" tire, I don't want really skinny tires or they will look dumb on my commander. Thanks for input in advance. Lane, Please call me at (800) 699-0947, ext. 6038 here at High Lifter. I've got a tire situation I want to share with you to see what to think.